Corned beef on rye with Russian dressing and coleslaw is easily the most delicious sandwich ever created. Don't believe us? Try it for yourself. It's related to the Reuben sandwich, but there's no Swiss cheese (or any cheese, for that matter) on this sandwich. And it features coleslaw instead of sauerkraut. Finally, it's not grilled—though we like to warm up the corned beef slightly before building the sandwich. You'll also notice that other than the number of slices of bread (2), we haven't specified quantities of the other ingredients. 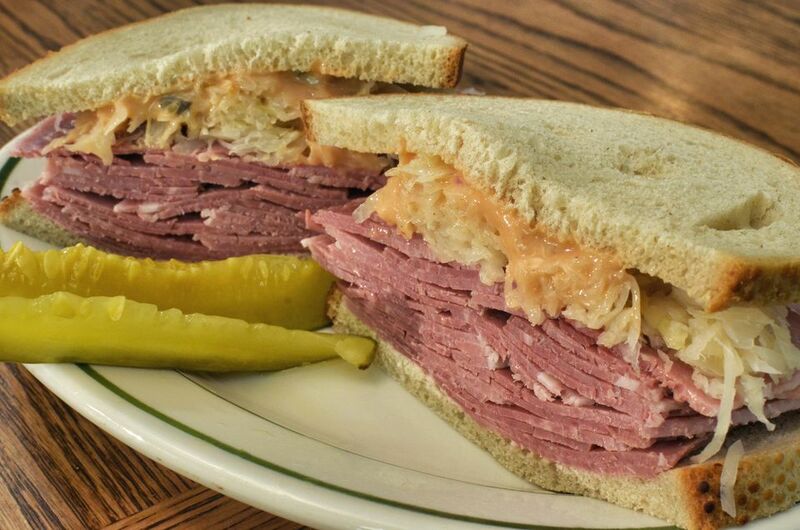 That's because the best possible version of this sandwich is made with as much corned beef, coleslaw, and Russian dressing as you can fit between those slices of bread. Heat the corned beef in the microwave for a few seconds until it is just warm. Spread one side of each slice of bread with Russian dressing. Scoop some coleslaw onto one slice of bread and spread it around. You want a nice, thick layer of slaw. Arrange the warm corned beef on the other slice of bread. Join the sides together, slice, and serve with a dill pickle.